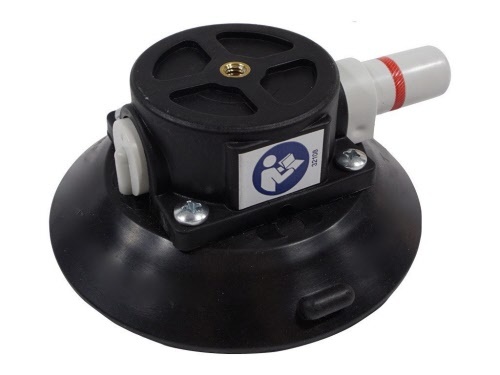 The vacuum pump suction cup is the professionals' go-to mount when they need a strong hold. The side pump creates a vacuum for the suction cup base that is second to none. The red warning line on the pump indicates when a leak has compromised the holding power. The top of the suction cup base includes an integrated 1/4-20 female thread, perfect for pairing with a ball-head mount or articulating arm. It is designed to hold on any smooth non-porous surface, but for best result, mount the suction cup on glass, metal, or non-porous plastic surfaces. Clean the surface to which the suction cup will be mounted. Hold the suction cup in place while pumping the handle until the red line disappears and the hold is rock solid. If the red line begins to reappear, pump handle to reestablish full suction lock. This mount is NOT intended for use outside the aircraft. As your altitude changes, pressure changes will cause the cup to lose suction. In the cockpit, this is not a problem; just pump the handle to reestablish suction. Outside the aircraft, product detachment is possible.